Nobody But Us is not Bonnie and Clyde meets If I Stay. It’s not. If I were to rate it only based on those comparisons, it’d be 1.5 stars. Yes, there’s a bit of a Bonnie and Clyde feel, in that it’s a couple on the run, but Will and Zoe are more than that. Zoe runs away from home with Will. She’s only 15, he’s 18. Their dream is to just run away from their pasts and their problems, and to start life fresh. They do have a bit of a plan, so they aren’t completely clueless, but they’re living on their dream. Then reality crashes on them and they are each forced to make big decisions about their future together. Zoe seems a bit mature for her age at times, and then at other times it’s easy to tell she’s only 15. I believe she believes she is in love, even if I’m not sure what she actually feels is love. Will offers her kindness and a way out, when everyone else in the town turns their backs and ignores the truth. I think Zoe falls in love with that, with the white knight, but it can be hard to tell as you read the novel. Will breaks my heart. He could have been so much more, but he’s given up on a system that gave up on him. He believes he is the only person he can trust and rely on all the time, but he wants to be better for Zoe. He wants to be the kind of guy he thinks she deserves, even if he goes about it the wrong way. Every decision he makes for the two of them breaks my heart just a little bit more. I can see where people might have issues with the destructiveness of their relationship, and to be fair, it isn’t a healthy relationship, not by a long shot. Will has temper issues and needs to learn how to control his violent urges. Zoe needs to be able to stand up for herself more and not rely on someone else to prove her worth. However, not once did I get the feeling this book was supposed to be a sweet romance. It was a book about how a destructive relationship destroys. It turns the good into bad and it makes happy endings hard to come by. Maybe that’s just how I viewed the novel. I just felt as though the point wasn’t to write a relationship that has typical teen issues, it was to write a relationship that was self-destructive not only to the relationship as a whole, but to the two individuals. 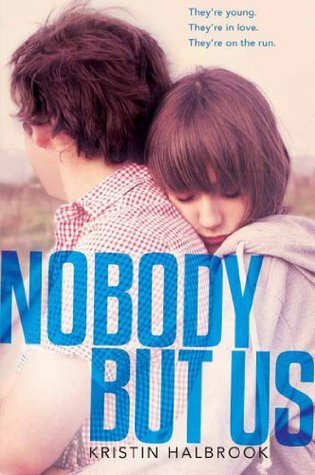 Nobody But Us was a rough, gritty novel that pulls are your heart and makes you hope, all the while, you know things can’t end well. It’s not like If I Stay meets Bonnie and Clyde, but it is a good book. Definitely worth a read. Thank you to HarperTeen and Edelweiss for an advanced copy of the novel in exchange for an honest review. This entry was posted in Contemporary, Young (and New) Adult and tagged Contemporary, Kristin Halbrook, Young Adult.